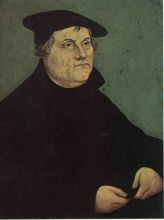 Lucas Cranach the Elder (Lucas Cranach der Ältere, 1472 – October 16, 1553) was a German painter and printmaker in woodcut and engraving. He was born Lucas Sunder at Kronach in upper Franconia, and learned the art of drawing from his father. It has not been possible to trace his descent or the name of his parents. His name of birth is differently known as Sünder, Sunder or Sonder. Later, he took the name of his birthplace as his surname. 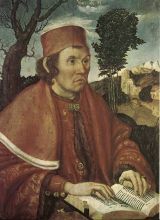 We do not know how Cranach was trained, but it was probably with local south German masters, as with his contemporary Matthias Grünewald, who worked at Bamberg and Aschaffenburg. Bamberg is the capital of the diocese in which Kronach lies. 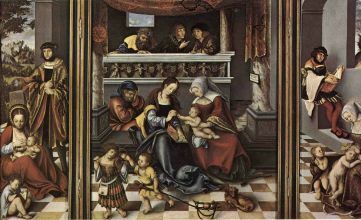 According to Gunderam, the tutor of Cranach's children, Cranach demonstrated his talents as a painter before the close of the 15th century. 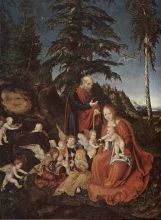 His work then drew the attention of the Elector of Saxony, who attached Cranach to his person in 1504. 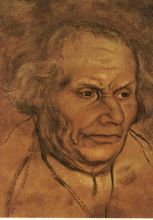 The records of Wittenberg confirm Gunderam's statement to this extent that Cranach's name appears for the first time in the public accounts on the 24th of June 1504, when he drew 50 gulden for the salary of half a year, as pictor ducalis.